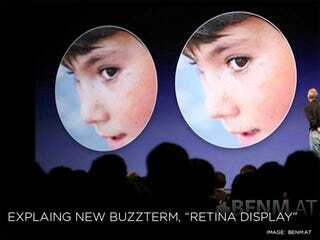 Steve Jobs mentioned an all-new "Retina Display" for the iPhone 4. But what exactly is a "Retina Display?" Apart from a marketing buzzword, it's essentially a high-end screen with four times as many pixels in the same screen real estate. All the breakthrough technology in iPhone 4 is situated between two glossy panels of aluminosilicate glass - the same type of glass used in the windshields of helicopters and high-speed trains. Chemically strengthened to be 20 times stiffer and 30 times harder than plastic, the glass is ultradurable and more scratch resistant than ever. It's got 78 per cent of the pixels of the iPad, but in a far smaller screen-size. That should mean colors will pop, and video, browsing, app-playing—whatever else you do with your iPhone—will be clearer than ever. This will be especially beneficial with fonts, whether they be in emails or when reading in the browser. An 800:1 contrast ratio doesn't say much—you know how misleading contrast ratios can be—but it sounds fantastic for a phone. It boils down to just how they measure it, but we do know that it's 4x better than the 3GS' contrast ratio. In the photo above, provided by BenM.at, you can see the difference between the lower-resolution displays and the new Retina Display. ...that's sharper, but mostly marketing hype. We know you. We know you wouldn't bow down to marketing pressure. So while fancy display terms such as "OLED" and "CRT" (snicker) are thrown around, bear in mind that this is just Apple's branding on what's essentially a super-sharp display.